One piece vertical wire, almost eliminates vertical wire movement from livestock pressure. 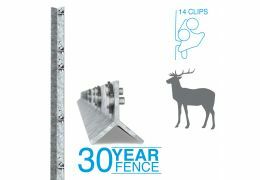 Deer X fence is the most popular size for containment and exclusion in forestry and farm applications. This lightweight mesh provides a cost effective exclusion barrier for most deer species at a cost effective price, more suited to areas of lower population. 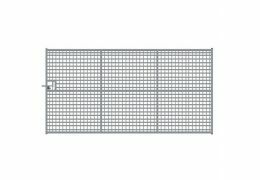 X fence Deer is a premium wire netting that will show true returns on investment. The one piece vertical wire allows you to space intermediate stakes up to 5m apart. The forged X knot provides a stiffstay netting that will virtually stand up on its own, which virtually eliminates vertical wire movement by livestock. An unobtrusive smooth surface X knot greatly reduces the risk of fleece removal or hide damage, Less stakes means less labour which equals overall savings . The tension curves and the spring like properties of high tensile wire remain taut throughout its life providing an effective, long lasting fence. Each roll has 450mm Pre-stripped ends for ease of tying off and joining. Taller heights and alternative mesh patterns can be manufactured. Watch our short video in the Media tab above to see just how strong X fence really is!